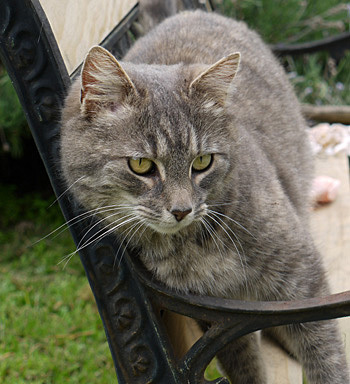 I've had a good idea for Lilli-Puss, my grey outdoors cat. Aha! I've caught Non-Gardening Partner unawares. 'It's a really tiny idea.' I tell him in my sweet, smiling voice. 'Will it cost me anything?' asks NGP, hemmed in on the couch, ever alert. The hay barn at the far end of the Hazelnut Orchard has three bays. The first gets the morning sun in winter, and is half-filled with hay bales. In the interests of cat safety and harmony Lilli-Puss has recently been relocated here. But there has to be more to a cat's life than a feeding station (even if well-stocked) and a cat basket. 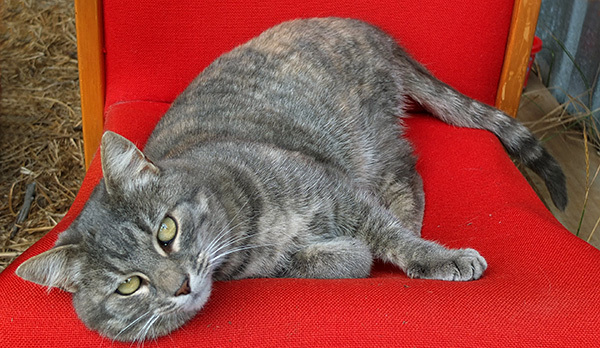 Lilli has chosen to lead a rather solitary life, with minimal contact. I see her in the garden, but she won't come near the house. I want this to change. I've promised her I'll be visiting the hay barn at least twice a day, to sit and chat, provide good company, pick her up more, pat her more, those sorts of things. 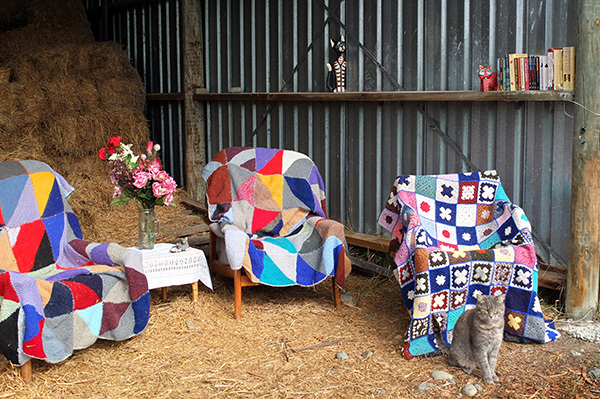 I want to set up a cat lounge in the hay barn, with armchairs, a table with a vase of plastic flowers, maybe a picture hanging on the side wall. Too silly? Totally daft? Possibly, but certainly more comfortable for human visitors than perching on a scratchy hay bale. Lots of gardeners have those trompe l'oeil features and they're just as silly, I reckon. A few days later Non-Gardening Partner moved some tractor-related machinery out of the way. Great excitement! I found two perfect old armchairs, another surplus seat, and some old-school knitted and crocheted afghans. Blast! I had to abandon my interior decorating to sing in a serious choir concert. The music demanded a close-to-perfection attitude, but my mind was full of Lilli-Silliness. I wondered about some cat ornaments, maybe a bed so I could stay the night... The creative mind soared to new heights of daftness, when it was supposed to be concentrating on tra-la-la-ing. The next day I found a little table, and carted all the furniture down to the hay barn in my wheelbarrow. Now everything is in place, including a motley book selection on the shelf (Georgette Heyer, Agatha Christie, and Thomas Hardy), should a visitor feel like a rustic read. +10Lilli-Puss loves her cat lounge. I'm visiting her three or four times a day. Good things happen to good cats, I tell her. And she purrs back at me. She knows.